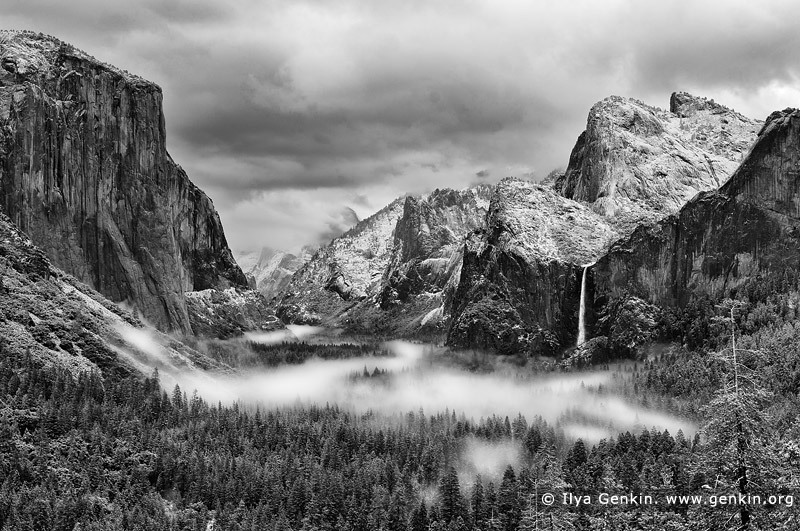 Black and white photo of the Yosemite Valley and Bridalveil Falls from Tunnel View early in the morning. Snow covered peaks, mountains and trees and morning fog is laying in the valley. Tunnel View, within Yosemite National Park, is a viewpoint on State Route 41 located directly east of the Wawona Tunnel as one enters Yosemite Valley from the South. The view looks east into Yosemite Valley including the southwest face of El Capitan, Half Dome, and Bridalveil Falls. This is, to many, the first views of the popular attractions in Yosemite. Many cars stop right outside of the tunnel to take pictures and absorb the visual aesthetics. This image belongs to the travel and nature stock photo library. This stock photo of Yosemite Valley and Bridalveil Falls from Tunnel View is available for licensing for commercial and editorial uses including websites, blogs, books, magazines, brochures and advertising. Restrictions may apply for images which contain third party copyrighted material or sensitive subjects. Photos of artwork are for editorial use only. This image id AMERICAN-SOUTHWEST-BW-0001 of Yosemite Valley and Bridalveil Falls from Tunnel View, is copyrighted © by Ilya Genkin. This is not a public domain image.